Two historians have researched archives, old photos and oral accounts to piece together the forgotten stories of Madrid during the Civil War. Leah Pattem found out more. 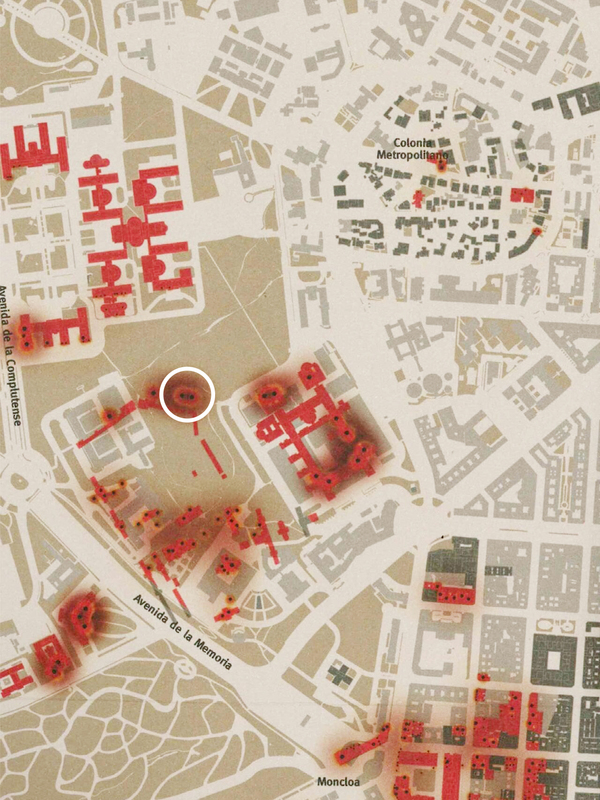 After spending two years digging through newspaper archives, collecting old photos and sifting through controversial historical accounts, the academic duo have assembled a detailed and accurate map of bombed Madrid. Each bomb impact is marked like a drop of blood, with some merging together to create larger stains. Many details of what happened between 1936 and 1939 are still buried in library archives, kitchen drawers and at the depths of people’s memories. However challenging these clues are to find, they’re there for us to do so. The greatest challenge, though, is pulling the crumbling pieces of this puzzle together so that the full picture – one once lost in time and censorship – can finally be painted and seen for the very first time. After Franco’s death and a gruelling 36 years under his regime, those in power ordered shrapnel scars to be plastered over, records to be wiped, coordinates of mass graves to be deleted, and voices to be silenced. This collective amnesia is known as the “pact of silence”, and was believed by many at the time to be the only way in which Spain could move forward. It’s something Spain is still unravelling today, both physically and mentally. Decades of pain was suppressed and, even now, we must tread sensitively while retracing our ancestors’ steps because there’s a danger that in revisiting one of the darkest eras in Spain’s history, we uncover not facts but rather interpretations of these facts. Newspaper clippings and personal accounts are inconsistent but photographs are much more reliable, and these are what Enrique and Luis are focusing their efforts on. 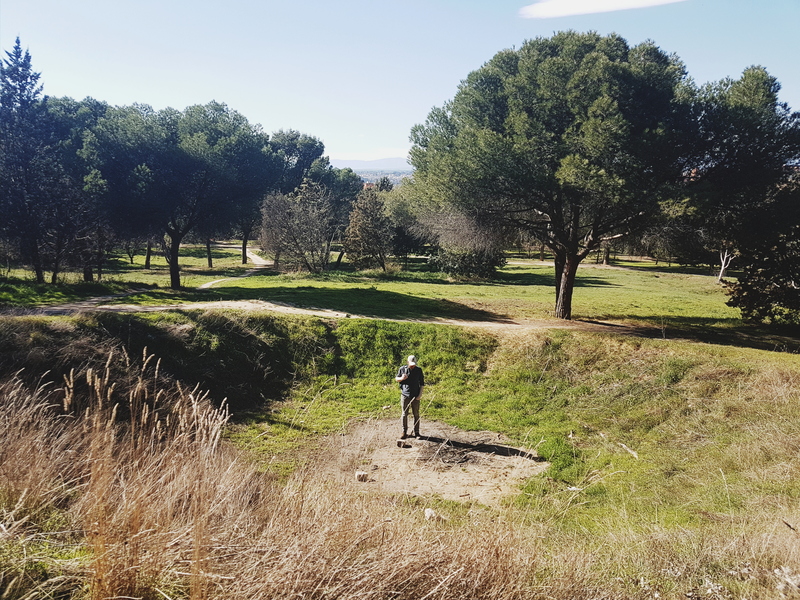 A friend of mine had told me that there was was a crater behind the university hospital, hidden deep inside a small, natural park. He pointed to the rough location of it on a map, and so off we went to investigate to see if it was still visible. We went off-piste until there was an abrupt a gap in the trees and the ground plunged. There it was: a huge crater caused by an underground explosion in a mine dug by Asturian miners to weaken Franco’s defences, who were positioned in the Hospital Clínico. There was no sign, no marker or plaque – just a fire pit in the middle, possibly used by those who live in the small slum just a dozen meters away. This map provides well-researched evidence that Madrid was pummelled by fighting during the Spanish Civil War, yet it took until almost 80 years later to be created, and it’s still not even complete. For as long as bombings and bodies remain buried, the trauma of the Spanish Civil War will sit firmly on Spain’s shoulders and will continue to be passed down generation after generation. The country is clearly still processing its civil war and it’s projects such as this one, and this time-bending photography project, that are helping the entire nation deal with its uncomfortable past and, as quoted by the authors of the project, "To turn the page of the story, you must first write it." A limited number of maps can be picked up for free from a selection of municipal libraries. Leah Pattem is the founder of Madrid No Frills, a blog that celebrates those overlooked corners of Madrid untouched by the gentrification and modernization that has transformed the city in recent decades. To discover stories that reveal the grittier, real side of Spain's capital, follow her on the Madrid No Frills blog, on Facebook and in Instagram.